Bak Full Moon Poya Program and Dhamma class will be held on on Sunday, April 28 , 2013, from 7:30 am to 5:30 pm at the Georgia Buddhist Vihara. We invite you all to join the program. Daham Pasala will be held on Sunday April the 28th. We hope that everyone attends. 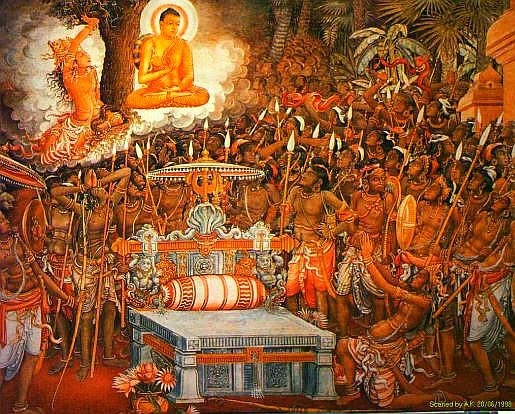 After Daham Pasala we will have a meeting to discuss the plans for Vesak Day Celebrations. Vesak is a very important day in Buddhism as we all know. It is important to remember and celebrate this festive day with traditional religious and cultural activities. We hope that everyone will take part and contribute to the activities by offering their ideas and support. Devotees will make hoppers to earn proceeds to support Georgia Buddhist Vihara. Please come and enjoy this delicious treat and support our values. Bakthi geetha-Primary Daham pasala children have already been given the song and we plan to practice it on the 28th.Please encourage your child to memorize it. The Older kids will be trained by Daminda and Sumudu Manamendra.It would be nice to have a parent Bakthi Geetha group as well. We hope that everyone builds a Vesak Kudu. Please encourage the entire family to add to the creativity. Use the Vesak kudu as a family activity and build and decorate it to represent the family and share the beauty and brightness of light with everyone by bringing in the finished lantern to the temple to illuminate. Please join by participating in a friendly competition afterwards. A contest will be held to pick the best one and the winner will be awarded a small prize.